Summary of passage: Joseph of Arimathea, a secret follower of Jesus, asked Pilate for Jesus’ body. Along with Nicodemus, the two of them prepared Jesus’ body for burial by wrapping it in strips of linen. Jesus was laid in a nearby tomb. 9) Joseph of Arimathea was a member of the Council and in good standing. He was a follower of Jesus. Nicodemus was also a member of the Jewish ruling council, a Pharisee, who came to Jesus previously to know him better. He spoke up for Jesus as well. Both were risking being thrown out of the synagogue by being near Jesus. 10a) They lost a chance to get to know God’s Son here on earth and be near him. They lost a chance to be eternally saved (we are never told these men confessed their faith in Jesus). They gained political power here on earth. Reputation. Status. Wealth. All by staying quiet about Jesus. b) They risked their positions, their lives, their wealth, their status, their family, etc. They gained the privilege of preparing Jesus’ body. They showed their love towards Jesus. They gained status in God’s eyes instead of man’s. 11) Personal Question. My answer: I believe I follow Jesus fully. Unsure of loved ones. I’m just not that close to many in my family. Conclusions: Love how we see these 2 men come to full circle with Jesus. End Notes: God used these men to protect the body of Jesus. Jewish custom was to bury the body before sundown and the start of the Sabbath. All indications are that Joseph and Nicodemus did this work themselves instead of slaves. This must have been difficult to remove the bloody body of Jesus from a hanging cross. These 2 men who were religious leaders must have known they were fulfilling prophecy. Can you imagine being in their place? How awesome! “One of the customs of the Jews in preparing a body for burial is the requirement to remove all foreign matter from the body and to carefully wash it. Joseph and Nicodemus examined His entire body and found broken pieces of thorn all over the head. They saw His bloody, matted hair; the terrible bruising of the face, the areas of beard pulled out, the dry and cracked lips. They turned the body over to see His shoulders and arms are riddled with splinters; each one was removed with care. The back, from the shoulders down, was a bloody open wound from the terrible scourging suffered before the crucifixion. His hands and feet were smashed and bloodied. On the front – just beneath the rib cage – there was a gaping wound made from the spear thrust that confirmed His death.” Taken from Enduring Word.com. Can you imagine? Jesus could have risen right then. But instead he hung dead on the cross. God’s perfect plan. · The burial demonstrated that Jesus was truly dead; it was proof of the glory of the coming resurrection. The myrrh and aloes were an extravagant amount of money. 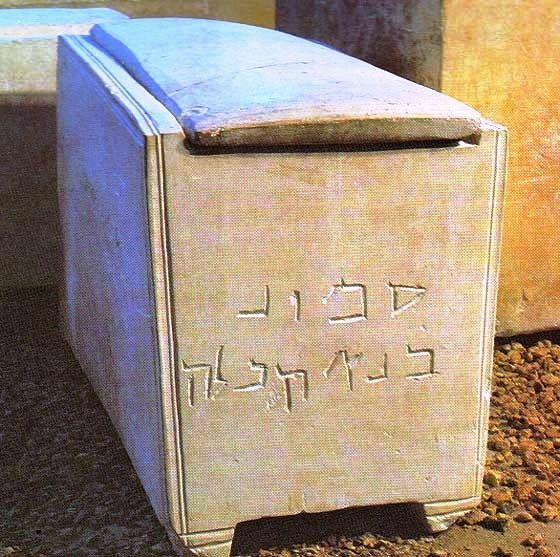 Matthew 27:60 tells us that this tomb belonged to Joseph of Arimathea himself. A rich man like Joseph would probably have a tomb that was carved into solid rock; this tomb was in a garden near the place of crucifixion. A typical tomb of this type had a small entrance and perhaps one or more compartments where bodies were laid out after being somewhat mummified with spices, ointments, and linen strips. Customarily, the Jews left these bodies alone for a few years until they decayed down to the bones, then the bones were placed in a small stone box known as an ossuary (picture HERE.) The ossuary remained in the tomb with the remains of other family members. The door to the tomb was typically made of a heavy, circular shaped stone, running in a groove and settled down into a channel, so it could not be moved except by several strong men. This was done to ensure that no one would disturb the remains. Adam fell in a Garden. And so we are redeemed in one. Spurgeon points out that the tomb was empty so no one could say Jesus’ body had touched the bones of a prophet and so sprung to life. Every detail recorded was super important to the Jewish people at that time too all would know–Yes, He is King! Your assertion that Joseph and Nicodemus were not saved is not supported by Scripture. Matthew 27:57 specifically states that Joseph was a disciple of Jesus. Hi, I recently started reading your blog as a supplement to my BSF study group, and yesterday during our weekly study I brought up the fact that Joseph and Nicodemus probably weren’t saved. I remember reading that they had not confessed their faith in Jesus, but I cannot for the life of me find the verse(s). Since you mentioned it here in your answer to question 10(a), could you point me to where that’s said? There are no specific verses because we are never told. All we’re told is they buried Jesus. Nicodemus did appear in John 3:1-21 to ask who Jesus was and John 7:50-51. He only appears in John and John never tells us he confessed his faith or what happens after the cross. He vanishes from history. The same with Joseph although he appears in all 4 Gospels. The Bible never explicitly says these men believed in Jesus. It is only inferred based on their actions. Does this help? Patrick and atozmom in Matthew 27:57-58 it says that Joseph of Arimathea was a disciple of Jesus. I can only assume by the risky and drastic measures both Joe an Nic took to bury the body of Jesus that they were true believers in Jesus. Actions always speak louder that words.